Professor Sir Peter Gluckman is one of New Zealand's most distinguished scientists. Sir Peter's research encompasses paediatric endocrinology, the developmental origins of health and disease, the evolutionary-developmental biology interface, and evolutionary medicine. 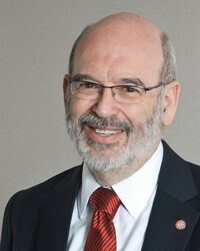 Professor Sir Peter Gluckman was the founding Director of the Liggins Institute and is one of New Zealand’s best known scientists. He believes that science must not be immune from its community and so he developed LENScience – an elaborate programme of experiential involvement of school children in science. His research has won him numerous awards and international recognition including Fellowship of the Commonwealth’s most prestigious scientific organisation, The Royal Society (London). He is the only New Zealander elected to the Institute of Medicine of the National Academies of Science (USA) and the Academy of Medical Sciences of Great Britain. In 2009 he became a Knight of the New Zealand Order of Merit replacing the 2008 Distinguished Companion of the NZ Order of Merit, for services to medicine and having previously been made a Companion of the Order in 1997. In 2001 he received New Zealand’s top science award, the Rutherford Medal. In July 2009 he was appointed as the first Chief Science Advisor to the Prime Minister of New Zealand. Professor Sir Gluckman is an international advocate for science, promoting the translation of discoveries in biomedical research into improvements in long-term health outcomes. He is the author of over 500 scientific papers and reviews and editor of eight books, including three influential textbooks in his subject area. Sir Peter continues to provide ongoing support and mentoring to the LENScience team.